The Mississippi River, Ojibwe, Great River, Big River, The Mighty Mississip', Old Man River, whatever you call it, the Mississippi has provided transportation, power, water, food, industry, and recreation for civilization for hundreds of years. I'm reminded of the majesty and history of this amazing river every time I drive the beautiful river road with breathtaking outlooks among the Western Wisconsin driftless bluffs and pass the various Laura Ingalls Wilder historic sites in the Pepin, Wisconsin area. I'm also reminded of the constant evolution of the river and its footprint when I pass Lake Pepin, a pool in the river formed by sediment from the Chippewa River where it merges with the Mississippi. I'm lucky to have such a beautiful fishery, and scenery, close to home. I've been fortunate to catch some nice bass and pike (even an owl) there. Locals speak highly of the fishery. Bassmaster Magazine recognizes several of its pools along the Wisconsin border in the top bass fisheries. 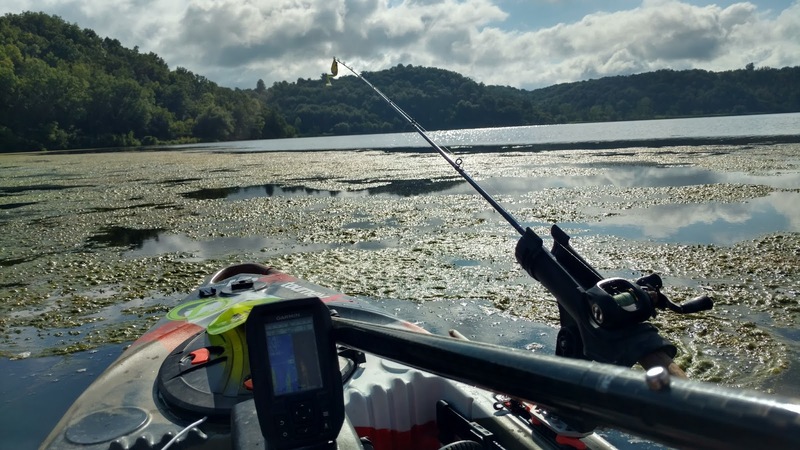 KVD, Ike, Hackattack, and other fishing greats search for bass on the LaCrosse, Wisconsin area pools for BASS and MLF events. A must-fish for anyone nearby. The Mississippi also provides amazing backwaters. Some accessible only accessible by few powered craft (airboats, duck boats, etc. 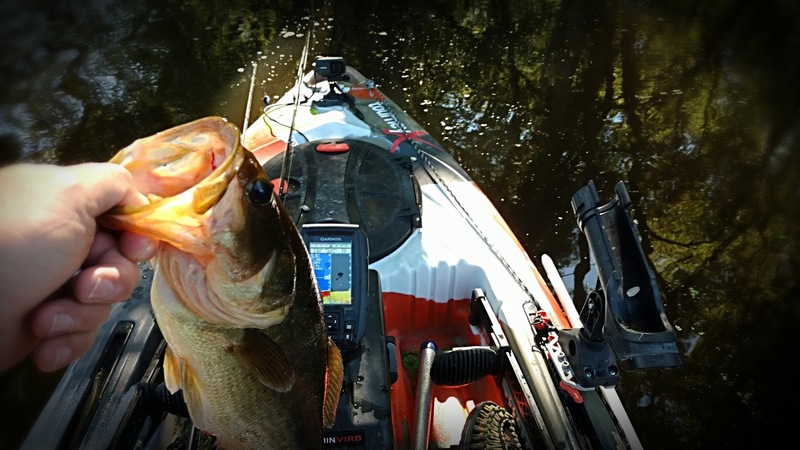 ), are a perfect environment for kayak fishing. Eager to find some tank bass with some prime froggin', a friend of mine reached out asking if I'd be interested in a day trip to the river. The plan quickly came together and we invited another new fishing friend, who brought another to join the hunt. 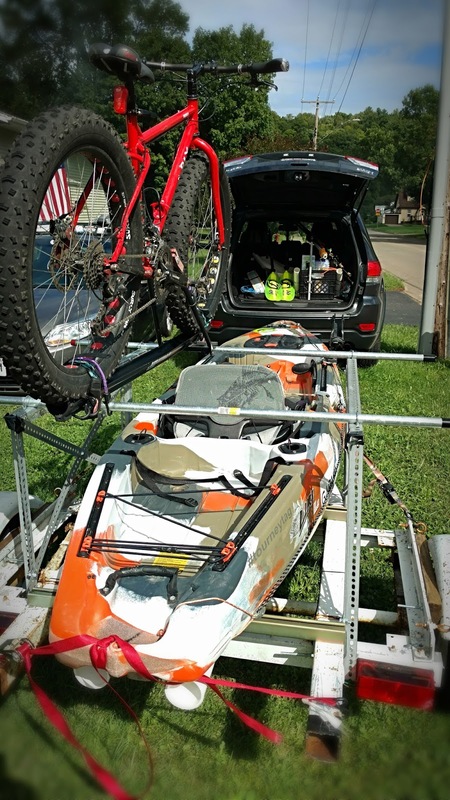 With an injured shoulder and bad back, I'm eager to try my jon boat trailer re-engineered to be a kayak/bike hauler with easy-load PVC. The night prior I load everything, as per usual, to mitigate forgetting key equipment. A possible day-ruining mistake on Big River. Morning-of my alarm bumps me out of bed and out the door. Running behind, I update my buddies on my whereabouts and ETA. I race the clock, taking some less traveled back roads. Smoother and straighter, they take me west faster until I hit the River Road and head due south. The river road is beautiful no matter the time of day. The bluffs overlook the river, and glare at Minnesota as if saying "Go Pack, Go!". The sun is starting to climb over the majestic bluffs, turning the sand colored cliffs a tint of orange, which then radiates across the glimmering river. This early in the morning, the local small river town businesses are closed except the bait shops. The road is filled mostly with trucks pulling campers or fishing boats. Each boat landing I pass on the main channel has a line of boats at least three deep waiting to get their haul of the multitude of species the fishery has to offer. I smirk as I roll south, knowing there I'm going there will be no lines. A short drive later, I arrive at one of the backwater launches. I greet my friends, and introduce myself to the new one. We all perform our unload and rigging rituals. This being my first time using my new trailer setup, I felt a bit disjointed, but I was satisfied with the trailer. In a short amount of time, we were all on the water. The pressure was on. I was a bit late, and I was the only one who had fished these waters. I wanted to show my buddies a good time and get them the great fish known to inhabit these waters. I start explaining to them some of the features I've found in the water in my time fishing the area and we naturally disperse to locate the patterns and location of the fish today. The water is cooler and higher than usual due to local rains and flooding. 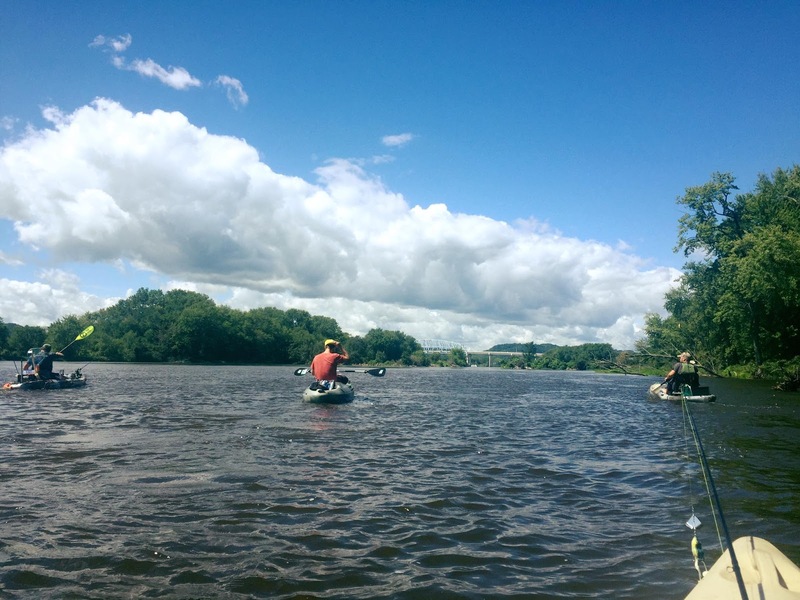 River fishing is always a challenge with the significantly changing conditions. But with the challenge comes greater reward. Perhaps some of those tank bass from the south have made their way up north to take us on a kayak sleigh ride. 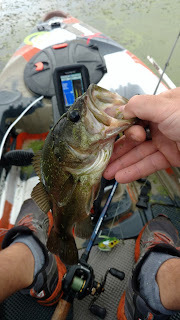 Having anticipated the flooding breaking up the weed mats I usually focus on in this area, I had a buzz bait ready to go on my Ardent topwater setup. A few casts in and I have the first fish of the day, which one of my buddies announces across the water to the others in our fishing party. It is a small Northern Pike, but a good sign the fish didn't get washed down to Louisiana with the flooding. I continue working the usual ledge I like to fish. When I encounter a few lingering weed mats that were able to endure the flooding, I opt to switch to the more weed-resistant frog. However, my usual "hot spots" aren't producing even a swirl or a bite. I grow disappointed, not that I'm not catching more fish, but that my buddies may have a hard time catching fish on this water I spoke so highly of. Allowing the current to take me back to my buddies, I work the opposite bank with a crank, also unsuccessful. Upon arrival to the first two, I check on a status. The deep hole I showed them is producing bites but nothing producing at this point. I paddle deeper in the backwaters where my buddy is working his topwater magic in a large area of lily pads. He reports a few fish and several bites. This tells us they aren't deep or sticking to the ledges. They are shallow in the calmer, warmer, backwaters seeking refuge from the cooler waters and fast currents caused by recent flooding. I suggest we hit a stretch of backwater with more space and less boat traffic. Where we are fishing now sees the occasional bass boat since the water is deeper. We all agree and begin the steam upstream. One of my buddies, a topwater master, was able to land several smallmouth bass suspended against rocks along the current as we made our way. No trophy fish, but I was happy to see someone in the group prove fish existed here. We abandon the as-the-crow-flies route and divert into a section of backwater to try our hand there. I personally hadn't fished the area, but it looked promising. This offshoot didn't produce any fish. However, it was beautiful. The current came through here, lazily flowing around the down trees and beaver dams. We came upon a circular opening in the water, where the current swirled. The varying, lazy, but powerful current of this river never ceases to amaze me. After emerging from the offshoot, the current switches direction and pushes us towards our destination. Allowing the current to carry us, we all work the vegetation on either side with various topwater tactics. I am trying my hand at a Booyah popper frog for the first time. As expected, as this was along a deep area with long current, there was no sign of life. What happened next was a low before my high in the day. 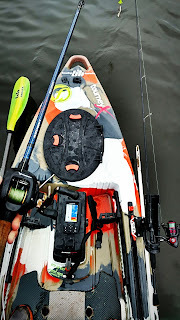 While allowing the current to carry me, I snapped my Bending Branches Angler Pro paddle into the holder on my FeelFree Lure kayak. This allows me to stand and fish in the current without worrying about my paddle, but it is at the ready. Nearing the bridge where we need to switch directions to enter the new slough, I pull my paddle off its holder. I've mad this move hundreds of times before. This one felt different. My kayak allows for limitless gear and rigging configurations. Its flush mount holders on either side are usually reserved for my baitcaster and backup baitcaster. They are equipped with bungee leashes to keep the poles attached to the kayak. My crate has DIY rod holders made of 2" PVC and hose clamps. These are usually reserved for my spinning setups, which I rarely use. They too have bungees available as a leash. I also have rod floats in my hatch that keep my rods afloat should they go overboard. I only use the leashes and floats in fast rivers, and this current wasn't terribly fast. I also had my brand new spinning combo in the flush mount holder, rather than in the crate. However, the spinning reel has a longer handle, and the reel sticks out further than the baitcasters. 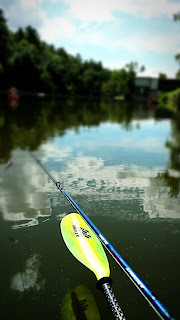 The odd feeling I felt before the "sploosh" as my paddle catching the reel and pulling it out of the rod holder, allowing it to slide into the water (this speaks volumes about how light the Bending Branches Angler Pro and Ardent Finesse are since the extra weight of the rod/reel didn't phase me until it was to late). I look behind me as I see my new James Gang Lure Company lure, and Ardent Finesse combo sink slowly to the depths. I'm of course frustrated at my own complacency but shake it off, refusing to let it ruin my day. After a short bout of venting followed by sympathy from my fishing my buddies because of my lost rod/reel, we venture on to the targeted backwaters. Nearing the same location where I caught a 19.5" largemouth earlier this year, I stealthily approach the narrow channel to the backwaters as to not spook any beasts that linger beneath. Working my popper frog, I'm surprised as a Northern Pike launches completely out of the water at my frog. Though he missed it, a fish launched 6" out of the water was a fun sight. I slowly work into the channel, tossing my frog into the long grass and slowly pulling it into the water. After two casts, I have a taker. A respectable bass, very fat. 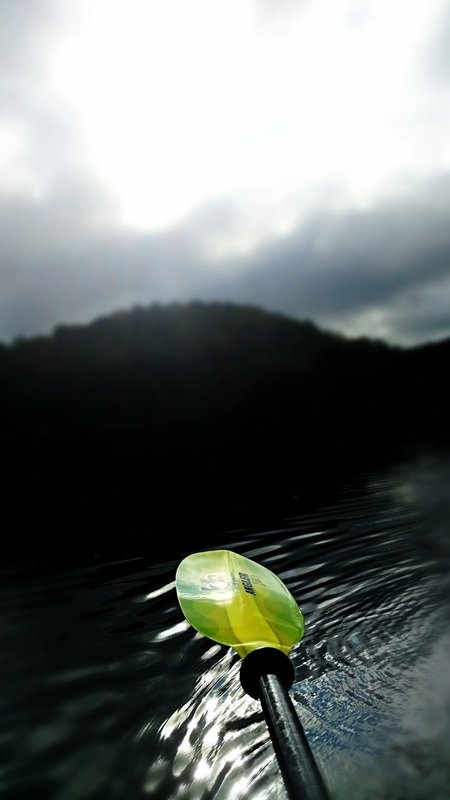 I let out my usual joyful sounds, like a kid catching his first fish, and pull him into the kayak. I'm slightly disappointed when I place it on my hawg trough. The girth of the fish was deceiving as it only measures in at 15.5". Still happy to have caught a descent bass, I admire the creature and toss it back into the water to get bigger. Near this spot, I toss my frog under a tree branch hanging in the water. The frog sails over the top of the last branch. I take this as an opportunity to lightly jig the frog into the water. On the second bounce, there is a blowup. I set the hook which launches the small bass out of the brush and towards my kayak. I laugh at the size/retrieve and toss it back. For kicks, I toss my frog in the same spot and repeat the over-the-branch jig technique. This time, on the first jig, another blowup. However, it is exponentially larger. Possibly epic. I set the hook. This time, the bass does not launch out of the water and through the tree. Instead my rod doubles over as my 50lb braid snaps the branch. This one is a tank! After a short battle thanks to the torque of my Ardent topwater setup, I land the bass while screaming with excitement. This bass has amazing girth. I was so elated it was all a blur. I may have been drooling, perhaps crying, I'm not sure (you will able to witness it on my YouTube channel soon). The girth of this fish is again deceiving. The fish measured in at just under 18". Whatever this one was eating, it was certainly high in fat. After some photos and showing it to my buddies, I release him to swim another day. 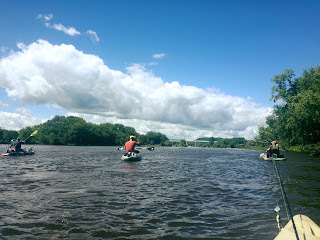 After the journey towards the main channel, we finally arrived at the target slough. Our fishing thus far indicated the fish were shallow in the sloughs. Likely staying away from the cooler, strong currents brought on by recent flooding. After catching two nice bass, the group is eager to find more tanks. We arrive at a down tree leading into the main part of the slough. The tree is floating in our way, the pencil-like bottom indicating a beaver had caused the roadblock. Using the stability of my FeelFree Lure, I'm able to push it aside so we can pass into the target waters. Shortly after arriving, the popper frog again produces fish, starting with a couple Northern Pike. I locate a school of them, one of which is huge, but I'm unable to coax a strong bite. Our party continues working the sides of the slough. All but one of us are able to coax several bites, misses, and land a few bass and pike. After a slow float-and-fish through the slough, we arrive at an offshoot of the main channel. We collectively decide to paddle towards the main channel to scout some rip-rap breaker walls and wood I spotted during previous trips. After turning the corner out of the sanctuary of the slough, we are immediately met with a strong headwind and current. 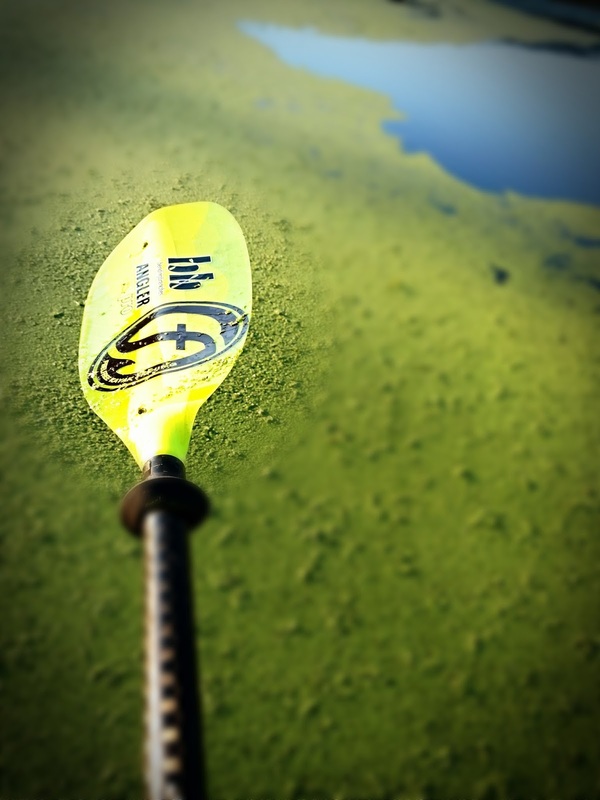 I drop the seat on my FeelFree Lure into the low position to make a lower profile and easier paddling. A short, but tough, paddle to the break wall into the main channel provides quite the sight. The walls provide shelter against the wind and chop that comes from the wide main channel, like a harbor. However, with the high waters, it is acting more like a funnel. The Ovaltine-colored water is rushing between the large rock walls. It is sloshing and whirling around erratically. Swallows are flying overhead diving down and grabbing debris, though I'm not sure if it is for consumption or construction. One of my buddies with the fastest of all the kayaks tries to make it into the main channel to fish the banks there. He is paddling feverishly like the Olympic whitewater canoes, but he is not making much progress. He quickly grows tired and allows the current to wash him back to where the rest of us watch in awe. He and another buddy opt to stay put and try for smallmouth against the current from the rocky shore while me and another shoot the current across to a large round shoreline where some of the current is washing around in a big circle. Our sonars show the impact of the current on the bottom. The 10-15 foot bottom quickly drops to near 50 feet and remains 20-40 feet in the round area. We try jigging and cranking for the deep fish we are spotting on our sonars. However, the current is swift and difficult to navigate in these high waters. We realize these are poor fishing conditions and dangerous, so we allow the current to push us back towards the slough from where we came. We make our way back through the slough, getting a few bites. Before exiting the slough, my buddy who had been skunked thus far landed two nice largemouth within a few minutes of each other. At this point, I'm exhausted. However, I'm satisfied with the trip. Everyone in the group caught respectable fish and had a great time. As we make our way back downstream, I toss my frog back under the same tree I pulled the toad from on our way through. I didn't expect a bite, so I was surprised by another huge blowup. Except this time, the branch I was hung over was much larger. The bass dove and my braid pulled tight around the limb, eventually allowing the lure end to go slack. The fish escaped, I was frustrated. My buddy tried tossing into the same spot before I went in to rescue my frog. He wasn't able to coax a bite so I moved in and freed my snag. Refusing to give up on the spot, I try a few more casts without success. The spot was burned so I moved on, taking a moment as I exit the slough to notice my deck. Almost pure green, a sign that it was an excellent day of froggin' on the Mississippi. We let the current to carry us back to the slough where we launched. Myself and a buddy decided to head in to load up while two stayed behind for another try at the deep hole they got bites on in the morning. Two of us loaded up and reminisced about the fish and good times of the day. When we were done, the other two arrived at the launch. We said our goodbyes, opting to make it happen again, and parted ways. This was a great day on Old Man River with great friends. This month has been a series of figurative and literal storms. Various medical challenges in my personal life along with poor fishing in my Small Craft Fisherman life. Part of the fishing storm has been due to actual storms, high waters, and brutally high temperatures. My latest outing was no different. Having hooked into, but losing, the largest bass I've had on in a long time, I was eager to hit my home waters hoping to lip it. A couple days before I ceremoniously de-spooled the mono that snapped under the stress of the tank and replaced it with 40 lb Gliss line. Gliss is strong like braid but casts for miles. While I'm add it, I clean, grease, and oil my reels to ensure a mechanically smooth trip. The morning of my 2 minute journey to my local water. I awake well before sunrise. I'm used to the early sunrises of the summer, and in denial of the nearing "hard water" kayak-unfriendly Wisconsin Winter growing nearer. 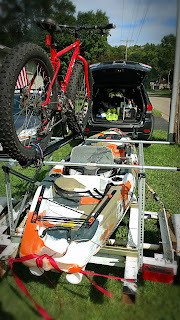 My car pre-loaded with my kayak and gear, I head to the fishing hole. I expected an empty ramp and lot given the heavy rains the week and night prior. As I approach the ramp, I glare through the pine trees into the lot looking for a flicker of reflection from a car or white from a boat trailer. Seeing none, I loop past the ramp where the dock is slightly under water. The lake is approximately 2 feet higher than normal. My expectations for a slob dwindle, but I'm determined to spend some time on my favorite body of water, on my favorite watercraft, doing my favorite sport. The morning is breezy and overcast. However, the local weatherman, who has the coveted AMS seal of approval, says a picture-perfect day awaits. Thus, I start my fishing on spots frequented by the fair-weather bass hunters waiting for the sun to light their way. After unsuccessfully working the first bay's waters, a thick cappuccino color after the week's heavy rains, I move onto the rip-rap bank. A few cranks in and I snag a small bass. It saves me the hassle of landing it and removing the hook by spitting the hook on its way to the kayak. The wind is picking up and my Garmin Striker 4DV is marking fish around the 10 foot mark. I paddle into the wind and ready a crankbait that will reach that depth. Allowing the wind to push me back cross the lake I begin cranking. While doing so, my Garmin shows the fish moving up in the water column. There are some topwater splashes around me. Another boat has joined me on the water. I can hear the distinctive "whoooshbzzzzzzzzz" of a buzzbait being casted hard against the wind and the distinctive "I got one!" followed by splashing of a fish being caught. Game on, my favorite bite is on. The sun has nearly fought its way through the clouds. The ramp begins to fill with other fishing boats looking to fish a beautiful day after a couple weeks of storms and thick heat. The usual boat-reachable spots become quickly occupied so I move into the thick mats with my Lunkerhunt frog and Ardent topwater setup. My frogging spot greats me early thanks to the wind carrying the smell of fish and decaying vegetation. This is where I feel at home with my topwater setup and go-to lure, the Lunkerhunt frog. I think I seen a hint of a smile come across the face of my frog, mimicking mine, at the smell of our home-on-the-water. Shortly after, the choppy water gives way to the heavy mat. My FeelFree Lure is first to enter, confirmed with the hiss of thick vegetation running under the hull. My Bending Branches Angler Pro starts its familiar shallow paddle, preventing weed buildup while cutting through the water. A few feet in, snuggled safely in the weed mat holding me against the wind, the magic begins. Frogging is my favorite type of fishing. I've spent a lot of time doing it, I like to say I have a sixth sense for frog conditions. My senses told me today wasn't the day. The frogging signs weren't there. Blowup holes in the freshly agitated weed mats, blowups at the edge of the mats, bluegill schools scattering for their lives. None of those froggin' signs were surrounding me. My addiction to frogging got the better of me, so I carried on. me. The second is the gift. The blowups can be deceiving and the 5-10 pounds of vegetation surrounding the fish after landing it are like unwrapping a gift. You never know what will be inside. I land my first hard-earned fish of the day and eagerly unwrap it. Instead of being greeted by a Red Ryder BB Gun, I'm greeted by a pair of socks. It is a largemouth, but only 12.5 inches. But like gifts, I appreciate getting something at all and the thoughtfulness of the gift-giver. 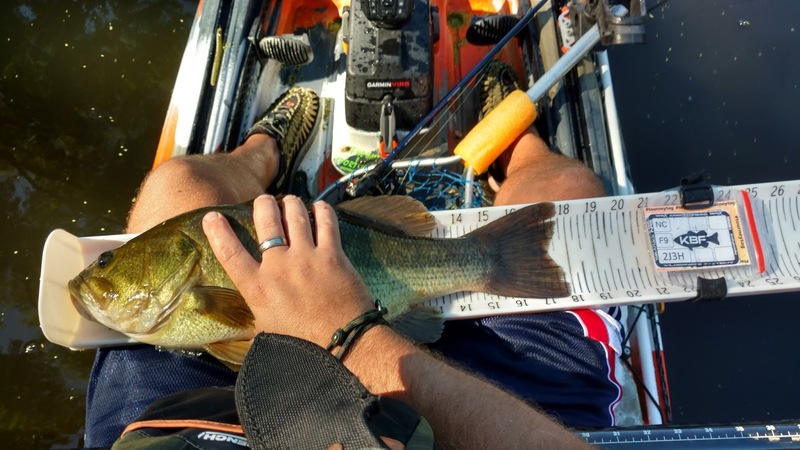 Since every inch helps on the Kayak Bass Fishing leader boards, I submit my fish to TourneyX, and release him to get bigger. I continue working the lake using various techniques but there are no takers. The lake has became busier as the skies turned bluer. Shortly after landing my fish, the small lake fell silent. Confirming others are weathering the same "storm" as I. I decide to call it a day and spend the remainder with my family. Life is filled with various storms. Fishing is a way to escape and help weather the storms in life (pun intended). Though fishing has its own storms, I don't let it come to that. A day on the water, no matter the fishing, as a relaxing day. I hope you are all happy, healthy, catching more fish than I, and successfully riding your own storms out. It has been longer than usual since my last article. I thank my regular readers for their patience. My wife had surgery (she is doing really well now) so I was playing nurse. With the wife recovered, I was looking forward to my return from fishing, kayaking, and blogging hiatus. The return started with planning a fishing trip with a nearby fishing buddy. We were going to visit a local lake known for large bass. I had only fished it once, briefly, but was pushed out by storms. The bass were infrequent and small, but we decided it was worth a try. The lake is small, but has promising vegetation, ledges, and other structure. Locals also tell stories of monster bass being pulled from there. Given the size and vegetation, it doesn't often see boat traffic. A perfect place to hit with a group of kayakers. We were also excited to learn two of the guys from the Wisconsin Kayak Bass Fishing Club were going to be in the area. A perfect opportunity to fish with them since their local waters are 2-3 hours away. I take my time the day before loading my kayak and gear. I had been fishing so often, the process had almost become a muscle-memory. Having taken time off, I was concerned about forgetting something. After completing and triple-checking the vehicle, I'm satisfied and relax for the evening prior with a 6:00 AM planned start time. 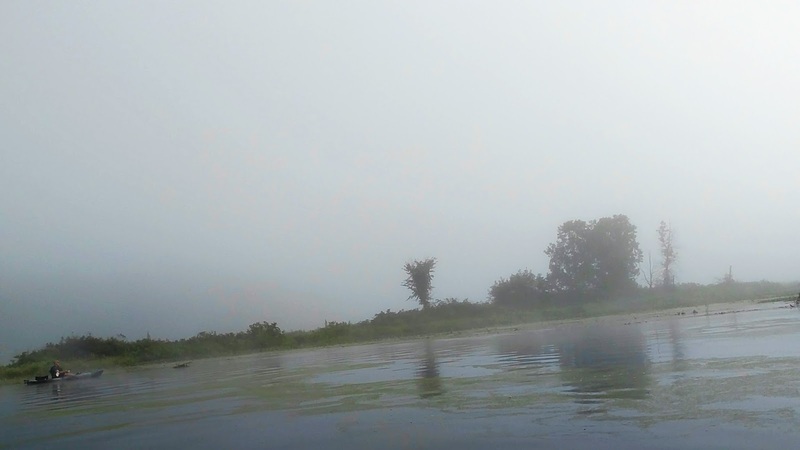 As I near the lake in the Chippewa River Valley where the lake resides, I drop into a thick fog covering the valley. With the rising sun blocked out, there is a chill in the air. A welcome change after a week of temperatures in the 80s and 90s and 100% humidity. I step out of my car, take a deep breath of the cool, fresh morning air and begin my unloading and rigging routine. Shortly after I begin, the rest of the crew pulls in. We exchange handshakes with those we haven't met outside social media and individually prepare our kayaks as the final fishing buddy for the day arrives. They were fishing with a fellow kayak fisherman the day prior in Minnesota. After a full day of fishing and a 2 hour drive, they were tired but eager to fish again. We hit the water and immediately two bass are pulled in near the launch. Not huge, but a good sign. Unfortunately, to make a long story short, the few others caught were very small. Two of the guys decided to make the 2 hour drive back to their Minnesota fishing hole, their sights on moving to the top of the KBF Regional tournament for this month. Three of us stayed behind determined to find the fish (and determined to avoid 4 hours of driving). After another hour of fruitless fishing, we decide to pack up and migrate to another lake close by known for good fishing. After loading we partake in a 10-minute-kayak-hauling-convoy to the next lake. It is a beautiful lake. Since it is still early in the day, it is not yet filled with recreational boaters. We eagerly unload and launch. The lake is calm, the bottom mostly sand and structure-free. The water is like glass and the sky bright blue. Timber is down near the rocky shore. 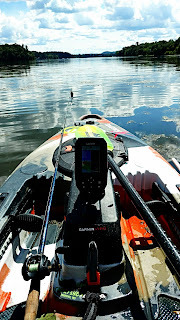 My Garmin Striker shows 5 feet near shore and 9 feet casting distance from shore. Perfect conditions for cranking. A couple casts in, I start getting hits. I eventually end up pulling in 3 bass. Small, but promising. While cranking, one of my buddies hauls in a good size bass topwater near the bank. He is able to snag into some smaller ones using the same tactics. The bite turned off as the sun rose. Continuing to work the banks with a variety of tactics we come to a rocky bank near a boat launch. 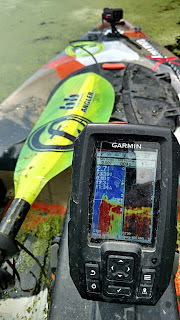 My Garmin Striker is marking fish around 4 feet. My buddy hooked into a small bass near the shore. Eagerly tossing a shallower crank in the area, I quickly haul in a bass. Not large, but getting bigger. While holding the fish on my hawg trough to snap a picture for my tournament, it slips out and self-releases back into the water. To add to the frustration, the fish, eager to escape, was able to stick me twice with the new treble hooks on the crank. Now bleeding, I cast and catch another bass about the same size. This bass also manages to self release before I snap a picture. 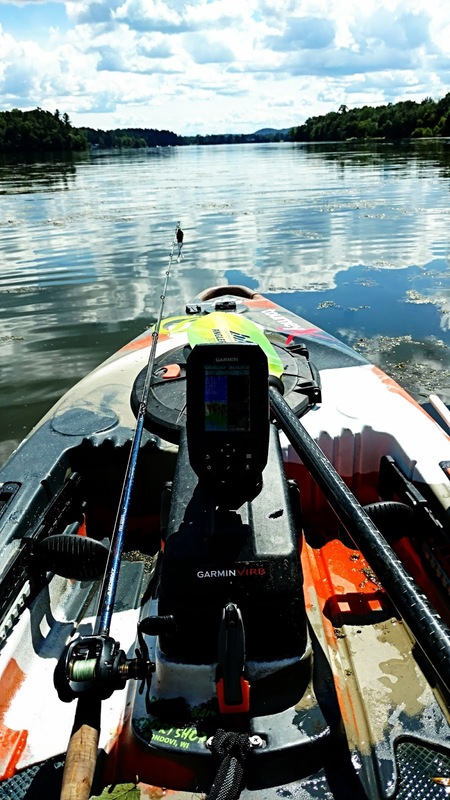 Striking out on big fish this side of the lake, we decide to paddle to the opposite end. 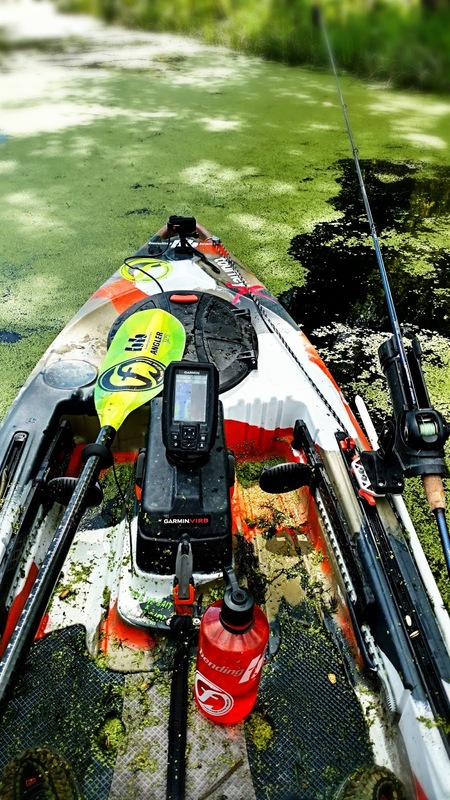 Navionics indicates a weed mat and underwater stumps. I plot the paddle, it is 1.6 miles across the lake. Exhausted, we are determined to find the big bass we heard about at this fishery. We take off across the lake in a long, tiring, but worth-while paddle. We had partially intended on a race, but we quickly realized that would not be feasible due to our level of exhaustion and boat traffic. We took our time getting to the new spot, but eventually made it alive. Upon arrival, we are greeted by a few small stumps. However, the water is getting a bit choppy from the wind and recreational boat traffic. But the beautiful weed mat catches our eye. 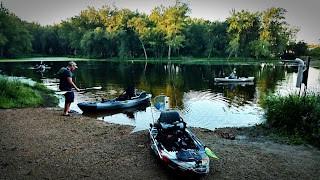 The three of us are topwater junkies eager to get some great topwater bites. This area is topwater heaven. The water clear, about 2-4 feet deep, surrounded by weed mats, fed by the river, and lined with brush. One of my fishing buddies is able to land a healthy 18" bass. He is able to land 3 more nice bass and a good sized Northern Pike in this area. I float over top of two 18"+ bass that casually swim away and miss a few big topwater blowups. 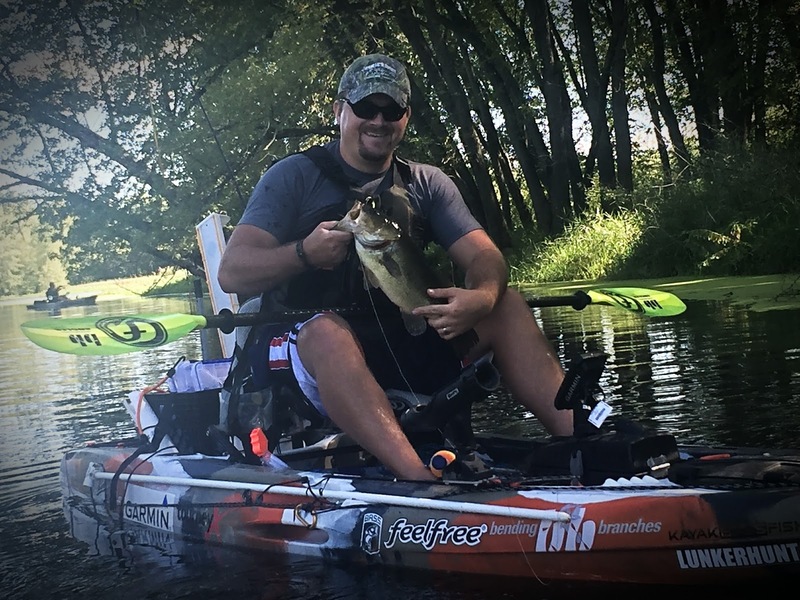 My other fishing buddy is able to coax bass fishing under his kayak to attack, but not commit to his frog. Shortly before leaving, he is able to land a nice 17" bass later through the thick weed mats. The sun is dropping in the sky and we are exhausted. We decide to point our bows towards the landing and make the 1 mile paddle back, in a headwind, to the launch. We eventually make it back, exhausted. Though we didn't catch trophy fish, we all were able to catch something. We enjoyed our time on the water with new fishing buddies. We talk about a potential river trip the following weekend with an even larger group closer to home. We shake hands, part ways, exhausted, but smiling, and looking forward to our next adventure.